Canvas has recently launched a new interface, and one of the great additions is “Draft State.” Draft State allows for users to set things to “draft,” which means that students do not have access to the item (assignment, discussion, quiz, page, module….etc.). There is just one small problem, draft state doesn’t work with documents. So, if you’ve loaded a bunch of files (.pdf, .docx, .doc, .xls, .ppt, .pptx….etc.) into Modules, and want to hide some of them, you are out of luck with the built in draft state functionality. Luckily, I”ve come up with a fairly easy around, that doesn’t really take any additional effort or time. 1. Go into Modules. You will see your recently created modules, and everything should have a green checkmark next to it, indicating that these items are “published,” and students have access. 2. If you attempt to unpublish a document, it will tell you that “publishing is disabled for this item.” This means that you cannot alter the “published” state of any document. 3. Create a module (I called mine “Unpublished Items). Add all of the items you want to hide from students into this module, and “unpublish” the module. This will cause the entire module AND anything in it to be invisible to students. 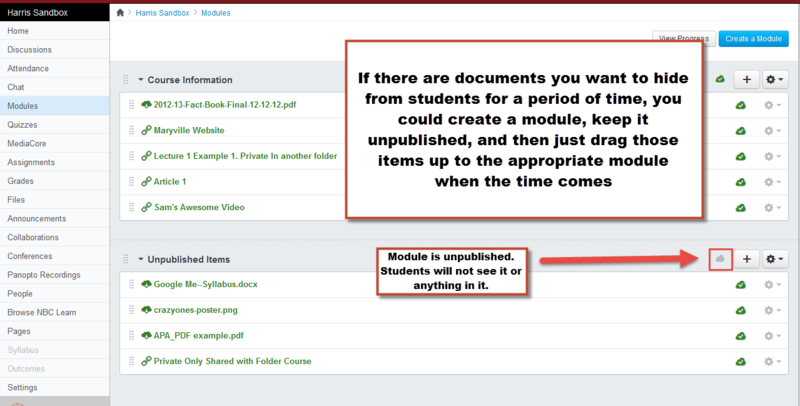 Then, when you are ready for a student to see a specific document, just drag it into the appropriate published module. Now, this really doesn’t take any extra time or effort to complete. Since you have to manually select the cloud icon to publish an item anyway, it doesn’t take any extra clicks to drag that item into the appropriate module using the method above. This entry was posted in Canvas and tagged Canvas, Documents, Draft State, Modules, Summer 2014 by Sam Harris. Bookmark the permalink.